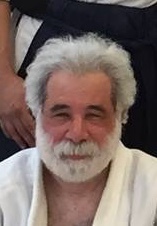 Kaicho, Bruce Bookman’s career in aikido began in 1970 as a 12 year old at the New York Aikikai, under the direction of Yoshimitsu Yamada Shihan. Bookman became the youngest aikido blackbelt in America at the age of 15. Upon receiving his black belt, he became a member of the New York Aikikai teaching staff. At age 16, Bookman was dispatched to Mexico City to teach for two months as temporary chief instructor until a permanent teacher arrived from Japan. He moved to Tokyo to apprentice at the International World Headquarters at age 19. There he studied intensively with Kazuo Chiba Shihan and other prominent masters of aikido at the Headquarters dojo, including Kisshomaru Ueshiba, the son of the founder. He studied for two years and was promoted to 3rd degree blackbelt. 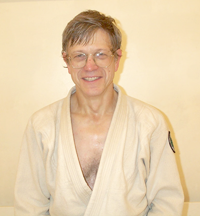 Bookman moved to Seattle in 1981 and established Aikido Northwest. At that time he became a senior member of the United States Aikido Federation (USAF Western Region) Teaching Committee under the direction of Chiba Shihan, with whom he worked closely for another 14 years. In 1998 Bookman was promoted to 6th degree blackbelt, a master’s rank. In 2000, he respectfully withdrew from the USAF to start his own organization, Tenzan Aikido, where he continues to teach full time. He also teaches by invitation, seminars around the country. 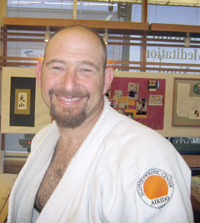 In addition to extensive cross training in boxing, tae kwon do, judo, iai-do, Bookman is a black belt professor of Brazilian jiu-jitsu with over 20 years experience. He continues his study of Japanese classical swordsmanship and weaponry with Araki-ryu Shihan, Ellis Amdur. Bookman has studied yoga, on-and-off since childhood. He co-owns the dojo with his wife, Colette Crawford. Both he and Colette follow the teachings of their beloved guru, Mata Amritanandamayi from whom they derive the most inspiration for their work in aikido, yoga and meditation. Chuck began studying tae kwon do in 1984 in the Maryland suburbs of the other Washington, and added some hap ki do in 1989. 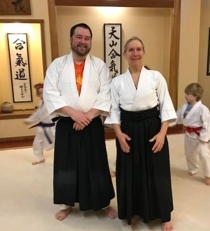 On recommendation from his tkd instructors, upon moving to Seattle in 1992, he looked into aikido, and happily switched to aikido under Bookman Sensei. He believes aikido by far the most interesting from a philosophical point of view of all the martial systems. Aikido's ideas of blending and harmonization as a means of addressing a physical confrontation are a powerful metaphor for how to approach conflict situations of all sorts. He thinks it is simply impossible to exhaust the opportunities aikido offers for physical and psychological challenges and development. Plus the aikido students are an interesting and caring group of folks. He thinks it a great activity to share with family members. Chuck has trained with all four of his children, two of whom are now black belts. I was a ballet dancer before moving to Seattle and marrying my husband ,Tam. I began practicing Aikido because our two boys, Max and Casey, were in the children's program and it looked like fun. It is, but it is more than that! Aikido is a unique package of athletics, meditation and community, and I was instantly and permanently hooked. I earned my black belt rank from Bookman sensei here at the Tenzan Aikido dojo, and in 2010, I became the dojo manager. I've been teaching either dancing or Aikido for 35 some years, including 10 years at the Pacific Northwest Ballet school. I have degrees in Psychology and Education from the University of Washington where my focus was the neuroscience of exercise. This academic study informs my personal Aikido training as well as my teaching. At Tenzan, I teach the preschoolers, the 6 and up kids, Teens and Advanced kids and the adults. I also lead the Women's Self Defense and Empowerment seminars. After extensive study of Tai Chi and Iaido,I began my aikido training with Bruce Bookman Sensei on April 3, 1993. I have been at it ever since. I remember thinking as I sat in seisa that the mat could accept all the mistakes I would make and it has not let me down. I have studied and taught in San Francisco, New York, West Palm Beach, Auckland and London. 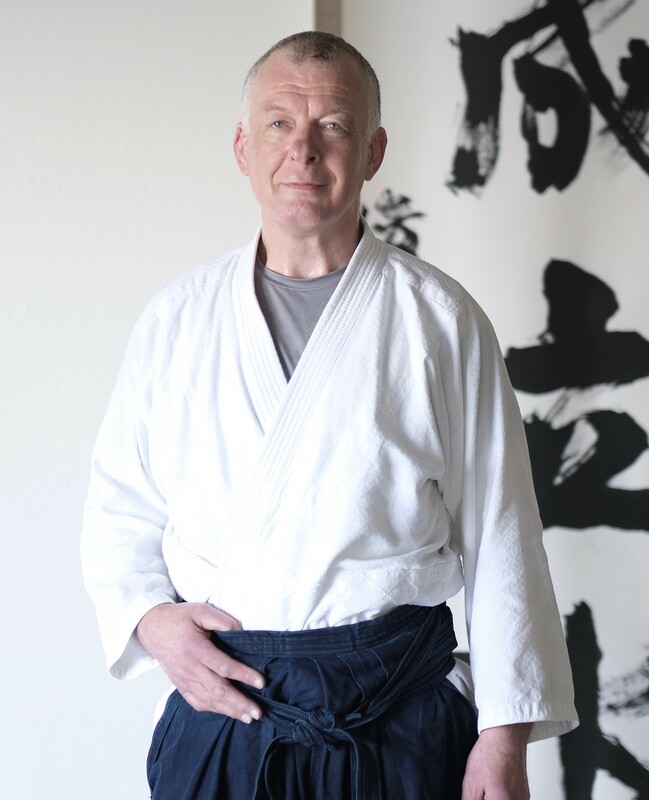 Bookman Sensei is the finest teacher of Aikido I have known with impeccable timing and a keen ability to see exactly what a student needs and how to communicate that to each student. 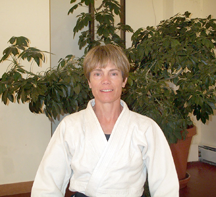 Brigid teaches weapons on Fridays at 5 p.m. and a beginners class on Sundays at noon. Jonathan has studied aikido with Bookman Sensei since 2004. 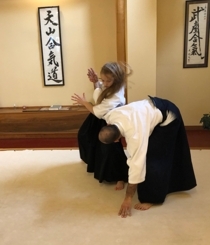 Before coming to Tenzan Aikido, he trained in shito-ryu karate for several years and brings some of this training into the aikido classes he teaches. In addition to holding the rank of Yondan (4th degree blackbelt) in Aikido, he holds a blackbelt in iaido and a blackbelt in karate. Jonathan also studies and practices Rinzai Zen and leads a meditation group at Tenzan every Thursday. I was introduced to Aikido by my wife shortly after we met. Honestly, it didn’t grab me immediately, but really enjoyed hanging out with her, so I stayed with it!! Slowly the art and I began to entwine, such that today if I go for an extended period of time without practicing, I notice a lack of centeredness in my daily activities. Within Tenzan Aikido I’ve been able to develop my intensity and spirit, while also enjoying the wonderful family dynamics fostered by the dojo. When teaching I try to balance my understanding of the art with whatever space the students bring. It’s a great experience! I was pregnant and living in So California when I first stepped out onto the mat. My children were homeschooled and at that stage not particularly interested in sport. I felt strongly that they needed to have some exposure to substantial physical education and never having heard of it before, I chose aikido. It wasn’t long before the whole family was completely absorbed in the training – well, all except for me because it was just too uncomfortable as my pregnancy progressed. Eighteen months after our daughter was born we moved up to Seattle and the very first thing we did was visit Bookman sensei’s dojo and signed up. There was a time when 6 Thompsons filed down the side of the mat towards the dressing rooms! I watched every kids’ class for 6 years before I felt ready once again to step onto the mat. It took me years and years after that to get my black belt (shodan) and then nidan. It was a long, slow process of intense and profound learning. It still is. Aikido has worked itself deeply into my way of being in the world. Tenzan Aikido has been my place for 24 years. It’s where I belong. Sholeh is a graduate of the Tenzan Children's program. She received her Black Belt from Bruce Bookman Kaicho in 2016. Before coming to Tenzan Aikido, I studied several different martial arts, including Tae Kwon Do, Jeet Kune Do, Kali, and Muay Thai kickboxing. Once my kids were old enough to start practicing martial arts, I decided that we should sign up for Aikido. I chose Aikido because it took us several years to train our son not to hit other kids on the playground and it didn’t make sense to start paying for lessons teaching him how to hit people more effectively. I started training at Tenzan in 2011 and found that Aikido was much more interesting—from a martial perspective and as a platform for personal growth—than the other arts that I had studied. What makes it unique is that it breaks the cycle of escalating violence. A peaceful martial art is a paradox. Yoga is peaceful. Fighting is not peaceful. Yet, Aikido finds a way to bring peace to a fight. I joined the dojo after watching an advanced class over twenty years ago and have been looking for the grace, fluidity and ease in themovements ever since I saw them that first night. When Bookman sensei asked me to help with the kids program I was both honored and nervous. Now eighteen years later I am comfortable and feel as if I am able to provide an enjoyable and safe class. The students are super fun and I love working with them. I received my black belt from Bookman sensei in 2003 and also am very passionate about Brazilian Jiu-jitsu which I've studied for over eighteen years. I started doing Aikido at Tenzan when I was very young (around 7). I didn’t know it then, but I was beginning a lifelong journey towards inner peace. I went from a brown belt in the kids class, to the teen class, into the adult ranks here at Tenzan. 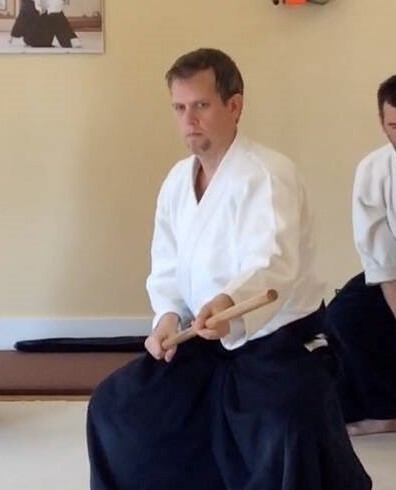 The changes I found within myself at the junctions between each rank, or each seemingly new piece of progress, are what I believe to be the true benefit from Aikido practice. I think Aikido is a vehicle for the pursuit of personal excellence, as well as an excellent way of self-defense, and this is founded on a deep philosophy of love and human unity. 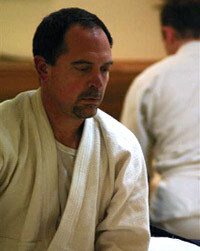 Bobby joined a North Texas Aikido club in 1994 and has trained in dojos across the country since. 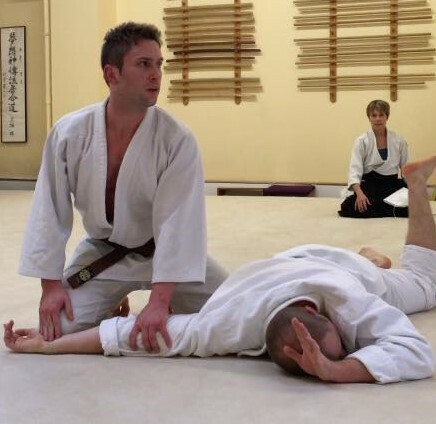 He first got on the mat at Tenzan Aikido in 2016 and began teaching in 2018. Before settling in the Pacific Northwest, Bobby lived for 2 decades in Brooklyn, NY, training with Yoshimitsu Yamada Shihan, Hal Lehrman sensei and others. His classes focus on learning the basics with relaxed, focused movement and awareness. Bobby works as a software engineer, applying day-to-day Aiki principles with people and computers. I took my first aikido class in 2007 and have been training at Tenzan aikido since 2012. I work as a pediatric anesthesiologist at Seattle Childrens and also teach at the UW School of Medicine. I apply the same principles of teaching on and off the mat emphasizing deep understanding of fundamental principles, techniques to improve situational awareness and sensitivity which lead to efficiency and effectiveness. For me aikido is a mirror into life, relationships and work. Aikido is ‘effort responsive’ - show up with the right mindset and you will learn. I believe that if you apply just the right amount of pressure at the right time at the right place and you can move a partner, a group or change the world. I grew up here at Tenzan Aikido with my father, Bruce Bookman, who is the Head Instructor of the dojo. Martial arts have always been engraved deep into my roots. I earned a junior brown belt after training 8 years in Aikido. I then fell in love with Brazilian Jiu Jitsu. My father tutored me in my formative years so I could understand the basics and always be prepared. For the past 4 years I have been training, teaching and competing full time and wholeheartedly in BJJ. I ran the children's program for Gracie Barra East Austin and also assisted in teaching the adults program. I have earned medals on some of the biggest stages of competition, including Gold in the Seattle 2017 Revolution, Seattle International Open, Gracie Barra Texas, San Antonio International Open and others. Jiu Jitsu is my passion. I like to workout with discipline, use my brain, and give to others. Jiu Jitsu allows me to experience all of this to the fullest. After years of talking about how much I wanted to try it, I began studying Aikido here at Tenzan Aikido in late 2009. I was given a membership and a trial month as a gift and never stopped coming. Aikido has been a blessing for me. It has opened up my movements, helping me to draw from and strengthen my core and add more fluidity to my movements. I feel Aikido’s influence on the mat and in my daily life on the bicycle and in the bike shop. I began as a helper in the children's classes nearly 2 years ago, and I have found it to be a source of constant inspiration and joy. Watching an inattentive or distracted child develop into an aikidoist makes it all worthwhile. As they evolve, they learn to focus while a technique is being demonstrated, eking out the essence of every subtle movement that Sensei makes. It’s like seeing a butterfly climb from its chrysalis. When those kids, like butterflies, learn to fly, it is fantastic! 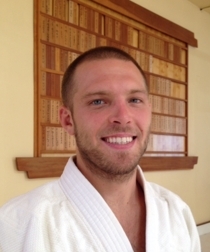 Aaron has been an active member of Tenzan Aikido since July 2014. He typically helps teach the 4:50 kids class on Mondays, and the 9:30 kids’ class on Saturdays. My desire to learn to fall in a graceful and safe way, at the age of 57, lead me to Tenzan Aikido. My professional background in yoga, massage and Feldenkrais are reflected in my passion for the elements of aikido for students of all ages - self defense, physical fitness, personal growth, focus, social skills, self reliance. These come full circle in the opportunity to assist in the Children's Program. It is an honor to witness the growth and deepening of these bright lights in our community.